Regular readers of this site will know that there was a brief period in which I took analog replay to high end levels, only to abandon it soon thereafter. Here’s how Artesania brought me back into analog! I hadn’t before collected any vinyl, but had decided to purchase a Michell Gyro SE with Orbe Platter, Tecnoarm and Benz ACE lo, along with a Lukaschek MC preamp. Because I had no software, I started buying second hand vinyl, but it quickly turned into a desillusion as sound quality never reached convincing levels. 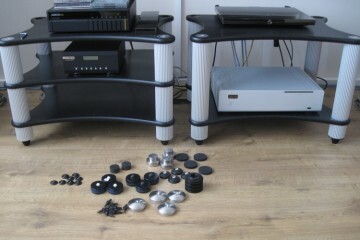 In retrospect it might have been down to a non-synergystic arm-cartridge combination but somehow I couldn’t get passed it and when comparisons showed that my dCS Delius+Purcell paired with any CDM1 or CDM4 swing-arm Marantz CD player sounded a lot better, I sold the whole lot. 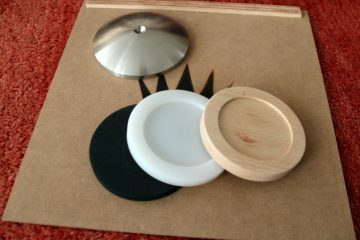 Ironic, then, that 10 years or so later, a review of the Artesania Platforms would reinvigorate the analog spirit in me. 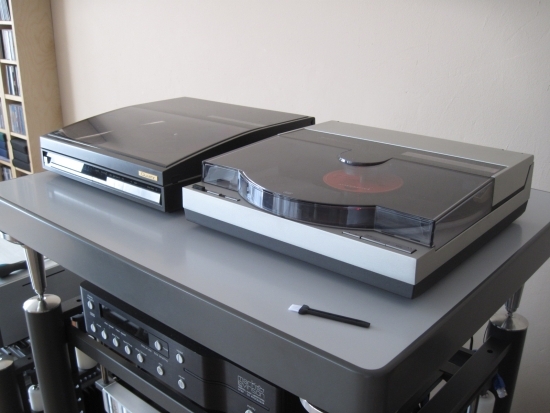 I started my turntable platform comparisons with the Krion Platform and placed on top a diminutive Technics SL-J3 linear tracker that a friend brought over. It’s almost 100% plastic but don’t underestimate it – I did initially, but upon setting it up connecting it, I was very impressed with how well its system worked and what’s more: it sounded much better than I’d anticipated. Was the Artesania Platform debet to this? I would later find out. I won’t explain too much about the various Technics turntables used, there’s a separate article for that, but suffice to say this funny little J3 was not only a fun starter for this section of the review, but it was also clearly good enough to kickstart my personal interest: I couldn’t help myself and had to obtain two higher end linear trackers, so I now have three, with various cartridges both MM and MC to play with. Being the first turntable in my system in 10 or so years, this little Technics performs to a much higher standard that you would expect. Its tangential arm system is cleverly constructed and works flawlessly. But it clearly isn’t high end and this was only the beginning of course. After a few tracks you start to notice that it could sound fuller, more refined, more room-filling, less plasticky/synthetic etc. The humble Technics J3 actually made me purchase a Technics SL-7 for myself. 35 or so years old, and still going strong, unlike the J3, the SL-7 is made of aluminium and zinc diecast, contains almost no plastic at all, and seemingly weighs a ton. 98% plastic J3 on the left, 98% aluminium diecast SL-7 on the right – just kidding with those figures of course, but the SL-7 really is almost entirely made of aluminium diecast, even the top part of its lid. Given its diminutive size, the SL-7’s 7KG weight really seems very heavy when you pick it up. 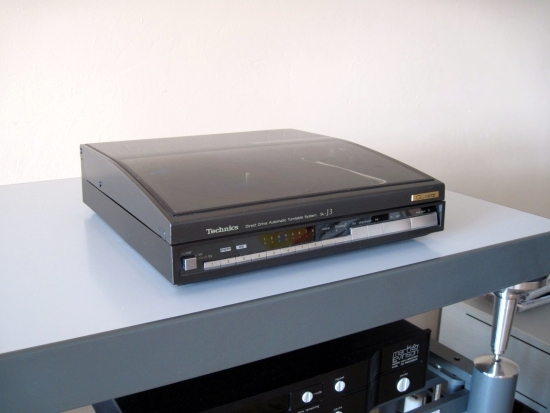 An SL-15 also made its entrance, and after it, even more linear trackers, but for now I’ll leave the Technics players and move on to the more serious work. 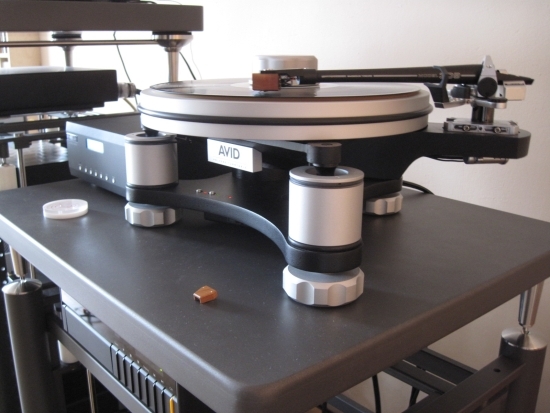 In order to get a well-balanced review, I also borrowed a beautiful Avid Volvere with SME 309 tonearm from Ben Hoedjes, proprietor of Studio Alkmaar, an audio store in Almaar Netherlands, that sell new and second hand high-end audio equipment. 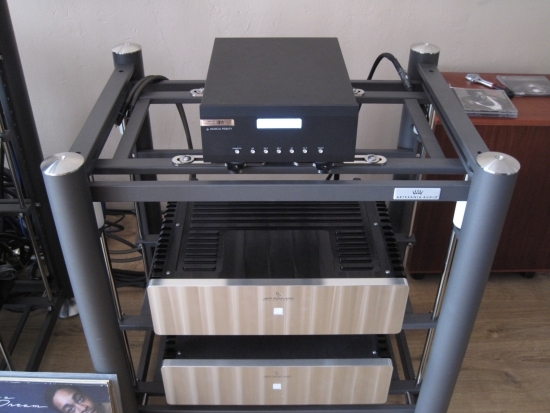 It’s like the Avid is made for the Artesania Platforms, or the other way around. Either way, I think that the combination looks mouthwatering. Isn’t this just pure eye-candy? I feel like a kid in a candy store. Of course the Avid is sitting on the wrong platform – it is a Digital Server Platform after all. But I was intrigued to find that the platform doesn’t bend at all under this heavy weight. 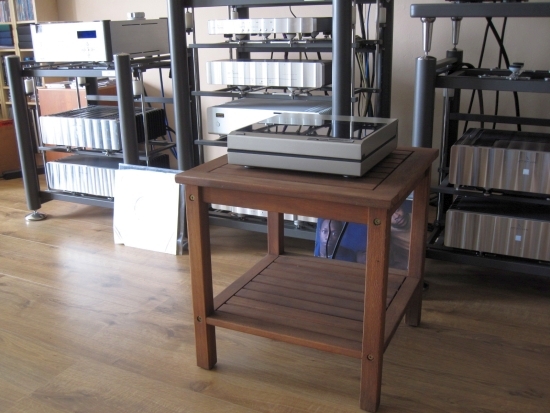 Before the Avid moves into prime position on the Krion Platform, I will compare the sound of the Technics players on the Krion Platform with their sound on a normal wood table, which I guess is how a lot of people would normally set up their turntables. 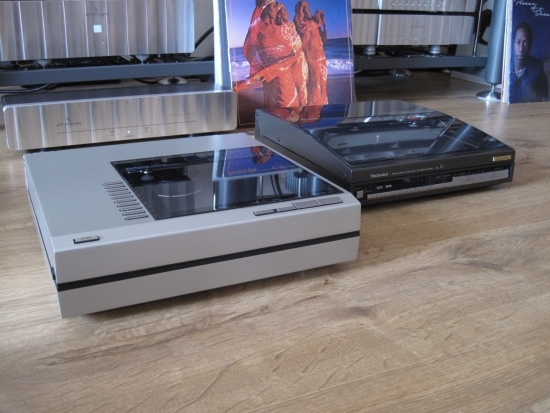 As you can imagine I carried out extensive comparisons between the various Technics players, using 3 different cartridges, and compared them all to the Avid Volvere. 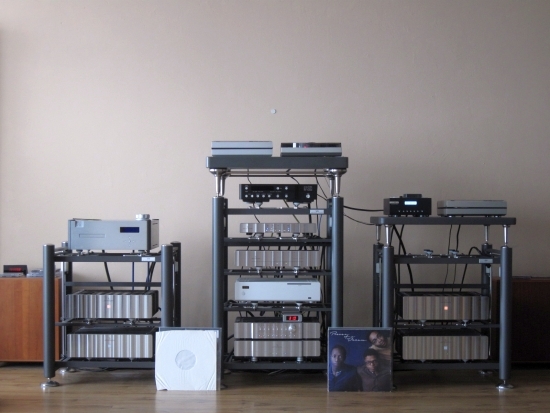 Apart from the Musical Fidelity M1 Vinl phono preamp I also had a Jeff Rowland Cadence at hand and along with the various ways to set them up and place them on the racks or platforms, this made for endless possibilities. For the finale, I invited two friends and we had ourselves an overwhelmingly interesting evening. For more info read the extensive review. 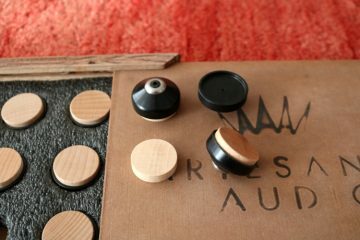 But this review is about the Artesania Platforms, so I’ll just skip straight to the part where we had picked our favorite player/cartridge/preamp. 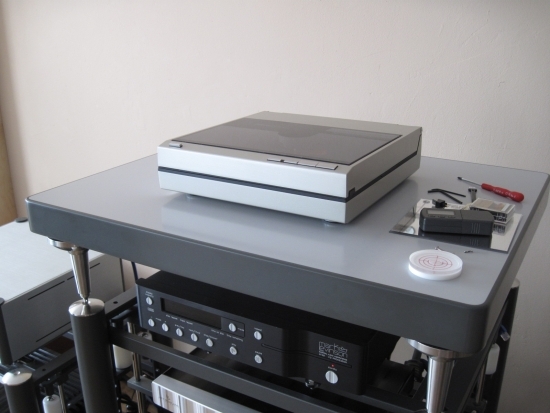 The Technics Linear Tracker choice of the crop was the SL-10 with 310MC cartridge into the Jeff Rowland Cadence MC phono preamp. One thing that I must mention at this stage is how flabbergastingly good the SL10 + 310MC sounds. It’s only natural that one would underestimate this player, and I did too, but I can tell you right here and now that it really is a fantastic player. It sounds at once powerful and big, with full, deep bass, as well as being tonally neutral and much, much more refined than it has a right to. This player retailed for 800 euro in 1982 btw. For the first assessments of the Artesania Platforms with analog playback, the SL10 will be used along with the Avid Volvere as benchmarks, for assessing the Artesania Turntable Platforms the way they were designed to: with turntables! 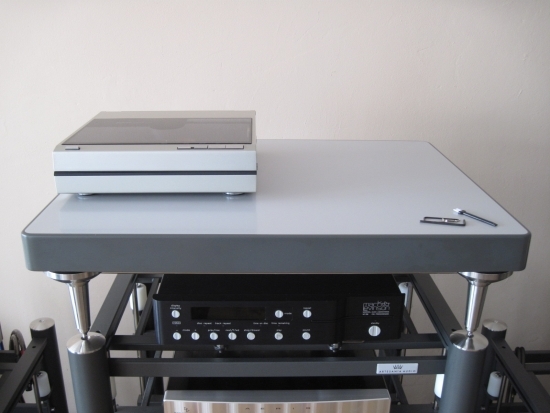 I mentioned earlier in this review that I suspected that the Artesania Platform might well have a very large effect on the sound of the Technics players, and now was the time to find out if this was the case. 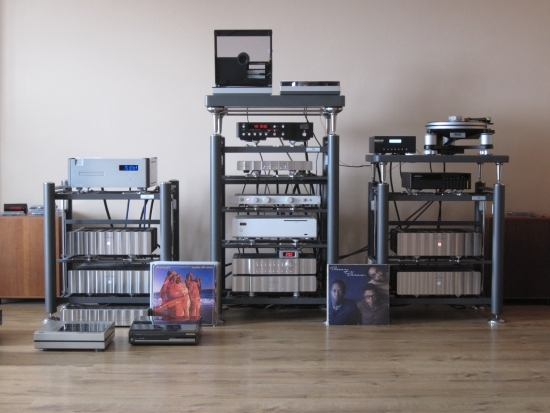 Until the final listening test, I always had 2 Technics players (SL10 and SL7) side by side on the Krion platform. A funny thing happened when I removed the SL7, to start the serious comparisons: bass tightened up, midrange opened up, and dynamic behaviour, already very good, also improved. We all heard it at the same time but couldn’t believe it. 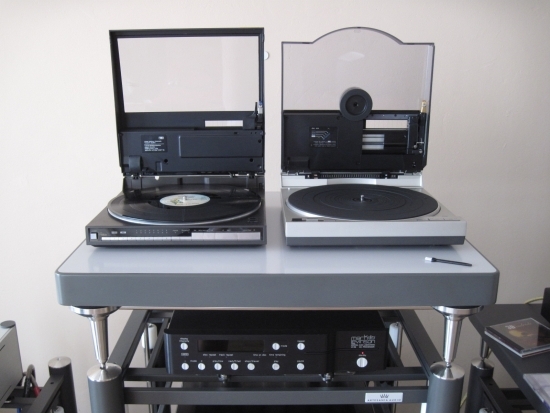 Go figure: the platform weighs multiples of the two turntables’ combined weight, and still it would matter if I remove 7kgs? But repeated tests showed that yes indeed, we heard it right the first time. But it gets better. Leaving only the one player on the platform, but sliding it into the same position as it was when the two players were set up side by side, produced the very same result! So, it wasn’t the weight, but the position on the platform. Apparently the spring-board principle is valid even on the 5,5cm thick Krion Platform. Placement precisely in the middle made for the best balance of virtues. All it took was 10 seconds for all three of us to realise that the wood table was absolutely not beneficial to the sound of the SL10. Where the SL10 and the Artesania Krion Platform were obviously synergetic, making for a highly emotional yet truely high end audio presentation, the SL10’s sound on the wood table was very mediocre at best. Bass was still full, but entirely without definition and very woolly. Midrange was recessed and sounded boxy, soundstage was a big blur laterally and there was absolutely no depth layering. Rhythm was severely hampered and the worst thing was that the sound had attained a colored, chesty hollowness, rendering the presentation dull and uninteresting. Even if this table was made of hard wood, and had no cabinet walls, it managed to severely color the sound, and not in a good way! 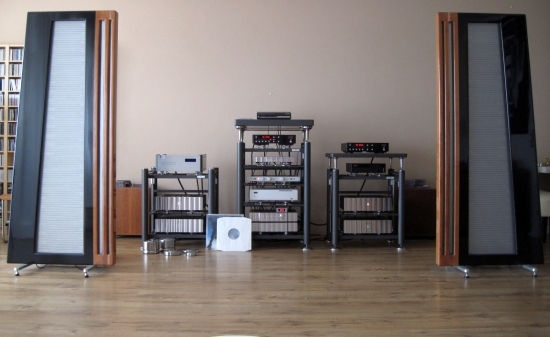 If ever there was an incentive to recommend a true audiophile audiorack and turntable platform, this was it. 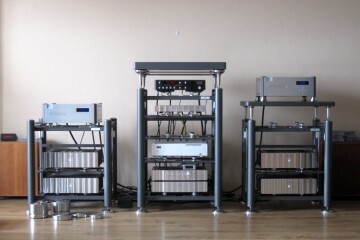 Then I started thinking: perhaps the Technics needs the benefits of the Artesania rack and platform more than a “proper” turntable with more serious suspension, such as the Avid Volvere? The Avid had thus far been sitting on the Digital Server Platform, just looking nice without having played a single record. I very much feared connecting it up, figuring that it would slay the SL10. That would’ve been sad for me because I like these tangential spinner so much. But it had to be done. 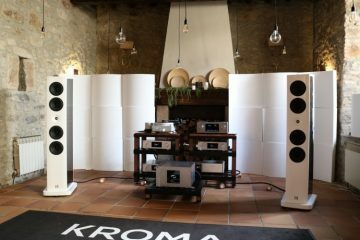 While leaving it on the Digital Server Platform, I felt that it sounded technically very good, with very stable bass, black backgrounds, excellent low level detailing and a warm, recessed midrange. 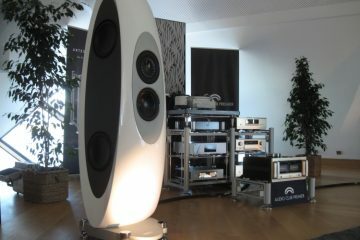 Tonality was a little richer than with the SL10 and the whole presentation was slightly more luxurious. Dynamics and pace however were a bit restrained, making the player appeal more to the mind than the heart. It was easy to admire the precision and handling of the 309 arm, as well as the idea behind the platter, which really is for turntables what VRDS is to CD players: the spindle sits a little higher while a larger screw-on damper forces the record to the platter. I felt that this pressure could be heard in the sound, producing both desired, and undesired effects. As a result I was not emotionally moved by the Volvere. I should mention though that at this stage I only had a Grado Statement Platinum 1 cartridge at hand, an 300 euro MM (MI to be precise) type. With its highish compliance, this may well be a less than ideal combination, so I’m not yet done assessing the Avid itself. For these first platform tests however, it will do just fine. Moving the Avid from the Digital Server Platform to the Krion Platform did precisely the same for the sound as it did for the SL10: to tighten up and open up the sound. Only, while with the SL10 this was a superbly synergistic affair, with the Avid the improvements only worked on a technical level, and not really helping carry the message across. Even if the Avid’s bass improved immensely, gaining tightness and articulation and the whole sound was a lot more energetic, in fact, I found the Avid to sound too controlled and too tight now. Of course this is a matter of taste as well, and some listeners might prefer this technically more accurate sound, but myself, I prefer more flow and fluidity. On balance I think it is safe to say that the Krion platform did not match very well with the Avid, perhaps emphasizing too much its already controlled nature (to be tested more elaborately lateron), or highlighting a less than ideal arm-cartridge combination. 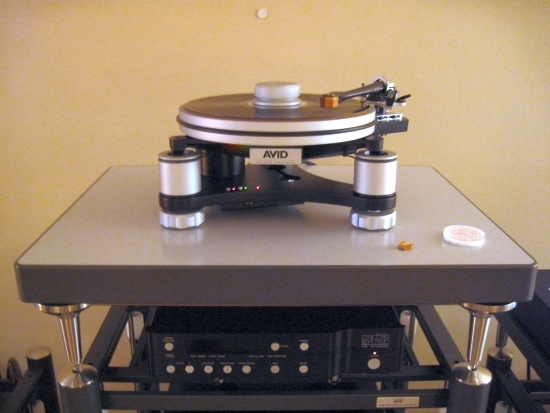 I will re-visit the Avid in part 3 of this review, when another cartridge to test it with is in: a Benz ACE. I’ve already mentioned that I’m not a big fan of the glass platform. Its presence between the speakers alone makes for an overly bity midrange, and tests done with CD players on top weren’t succesful either. But because I had thus far only carried out tests using digital equipment, I couldn’t be sure that matters would be the same with turntables. So, out went the Krion and in came the glass, with the Avid on top. 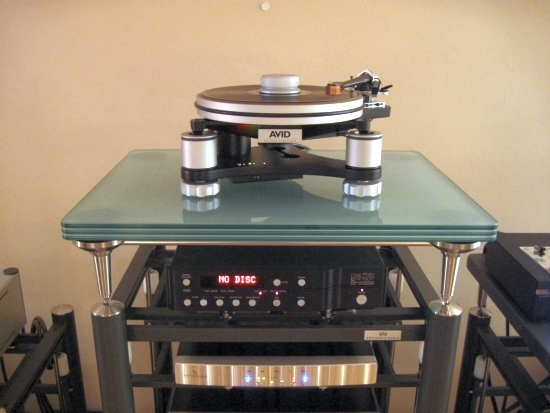 The glass platform sure is a looker, no doubt about that, and I think that the Avid looks even better on it. The resultant sound however was very, how shall I say this, un-analog. In fact, it was very reminiscent of digital. I honestly can’t say that it sounded bad, and technically it was impressive in a way, but to me the sound had just lost all of what made analog so appealing in the first place. There was sublime control, and the glass certainly doesn’t ring or anything, but the presentation was so very tight and controlled, so dry and devoid of color, and the transients so short and peaky, that I couldn’t enjoy the music anymore. Instead of caressing me, I felt that the system was now shouting at me. That closed the chapter on the Glass Platform for me. 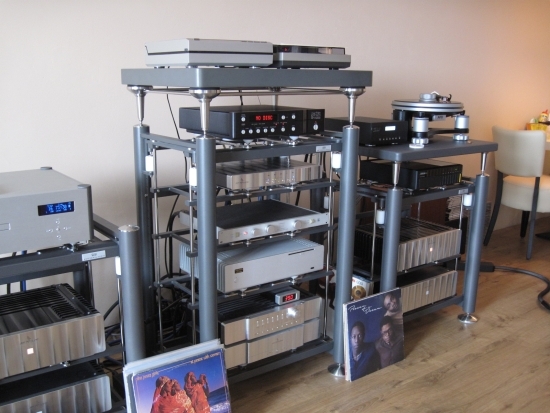 If you have a very warm and smooth sounding turntable and ditto speakers, then maybe it will compensate nicely, but frankly, I feel that the Glass Platform is too much removed from the superb neutrality of the Exoteryc racks and Krion Platform. While I ultimately preferred the SL10 and Rowland Cadence combination, the Musical Fidelity M1 Vinl really is no slouch at all. 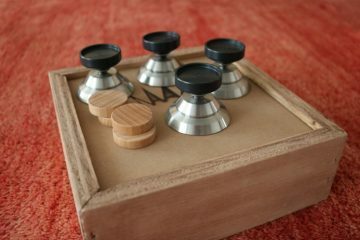 The details can be found in the Turntables review, but no matter MM or MC input, in short the MF sounds very, very good: deep and full, yet articulate bass, natural uncolored (but not devoid of color) midrange and airy, grain-free treble. Importantly, its timbre is spot on neutral and there’s not a trace of artifice. For around 800 euro, I can’t imagine that one could do better. If you dig deep, it can be beaten of course, for example by the Jeff Rowland Cadence, which beats it in most areas, except the bass, which is more powerful and articulate with the MF. 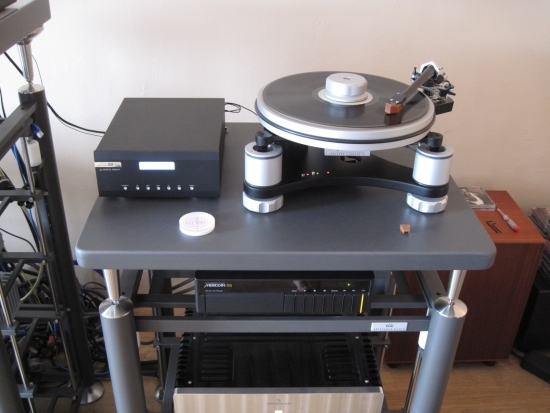 Anyway, getting back on track with the Artesania review, finally it occurred to me that we had only listened to the M1 Vinl sitting atop the Digital Server Platform. 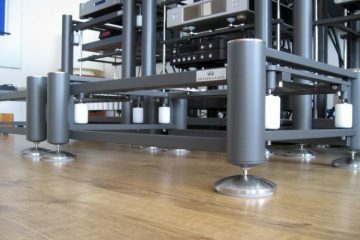 Moving the M1 Vinl from the Digital Server Platform and right onto the Exoteryc rack made for a baffling difference: the M1 Vinl hadn’t completely transformed into the Cadence but it was now much closer! The midrange gained much more of that typical Jeff Rowland luxuriousness, treble, already very good before, became even subtler and airier, and the soundstage layering also improved immensely. It’s that I had the Cadence at hand, otherwise I would probably be fully satisfied with this little Musical Fidelity unit. Such is the influence of the Artesania rack. 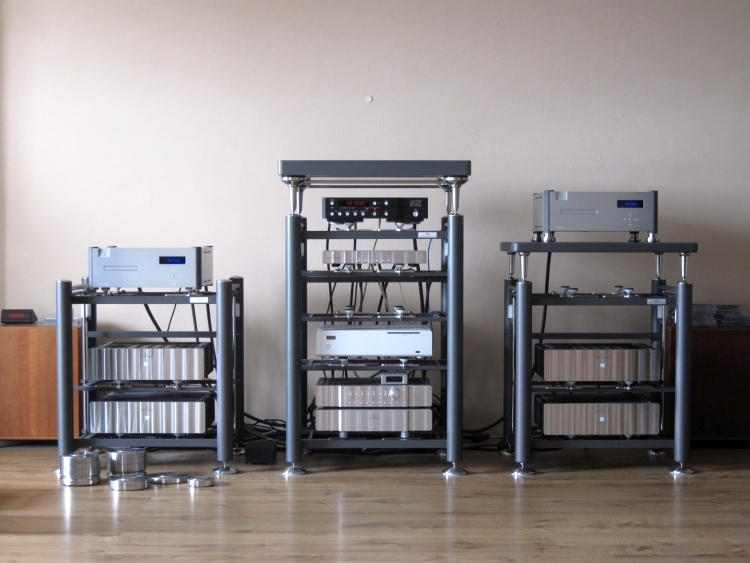 In the next installment I will also listen to the Digital Server Platform using a Digital Server and I will discuss the various Artesania dampers. I intend to keep adding installments to this review, as I gather more experience with other turntables: this review is not finished anytime soon.